Austin Tri-Cyclist, located just across the street from packet pickup at the Palmer Events Center, is a popular stop for runners in town for the Austin Marathon and Half Marathon. Before this Sunday’s big race, stock up on last-minute needs like nutrition, fuel belts, BodyGlide, gloves, hats, visors, compression wear, and more. Vendors from Altra, Bonk Breaker Energy Bars, and FuelBelt will be at ATC Barton Springs on Saturday, February 15, for demos and samples. ATC now carries run shoes at both the Barton Springs and Westlake location. 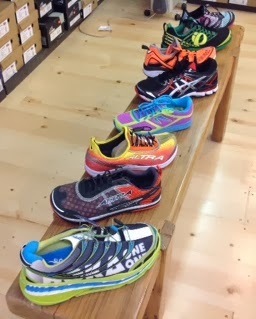 Check out the new shoe center at the Barton Springs store, with brands Asics, Altra, Hoka, Zoot, Pear Izumi, and Newton. Any 2013 models are 25% off! Up next is triathlon season, so get the gear you need for swimming and biking, too. ATC has a legendary selection of wetsuits (ask wetsuit guru Missy Ruthven for fit tips). Also, the new Cervelo bikes are in, so you can test ride everything from the new P2 to the new R3. Tri sales include 25% off 2013 triathlon clothing and 15-25% off 2013 bikes and wheels.